I’m writing this because I want Chris Evans to notice me. I didn’t write it when I had the dreams some one, two years or so because I thought there would be a connection and he would know me. But since he wasn’t made aware of me, I have to seek to get his attention like this. I wanted to tell him in person but my feelings don’t get to him so I’m forced to look for him some other way. I don’t remember the dreams well. I decided to write them down so I don’t lose them completely. The first dream happened like two years ago. We were in the lounge of our house and were like listening to one of the teachings of Dr Shawn Smith. It seemed we were the participants and there was a table where the speakers sat. Chris Evans was one of the people seated at the table, like he was one of the eminent guests. We followed what was being said and in the end, people began to appreciate the message. Each man stood up and gave his impression. Wow. I didn’t know Chris Evans knew my name. Yet when he spoke, the other eminent people listened to him and gave me audience. Then I stood up and gave my impression. It was an expose on life and immortality as I heard it from Dr Shawn Smith, how Jesus Christ abolished death and brought life and immortality to light through the gospel. I said, if something was abolished, it was obsolete and of no effect. Humanity had now put on immortality in that one died for all and so all died with him seeing all were in him. And then this one who died with all in him rose again and brought out of death the all that were in him. And since this one doesn’t die anymore seeing a man dies only once, the all that are in him do not die anymore for they died once in the one and now that he is risen, they live forever in him. It wasn’t totally that that I exposed but it was on life and immortality. And my arguments were strong; worthy of all acceptance. And the people listened to me and Chris Evans too, and approved what I said. They too were of the same mind, only that it was I exposing what we all were persuaded of. When I woke up from sleep, I was happy because Chris Evans called my name and that I exposed before him and all the eminent guests and people present on the fullness of the gospel of Christ – life and immortality to humanity in the one man Christ Jesus. The second time I saw Chris Evans clearly in a dream was like in February 2017. My brothers and I were at the balcony that night and conversing about righteousness. My brothers said righteousness was everything. Our understanding of it was the thing. When you know you’re righteous, you don’t need to do anything. You don’t need to stress or lament about your life or the state of the world because you know that you’re complete, you lack nothing, you need nothing. Then we remembered the passage that said the kingdom of God is righteousness, peace and joy in the Holy Ghost. The kingdom of God was not in performance, observance or attitude. It is in what Jesus Christ accomplished for humanity without needing the assistance of anybody and giving it to everyone as gift, that is, righteousness. I don’t totally remember what my brothers said but it was clear to us that night. And I went to sleep satisfied, knowing that I was complete and whatever I was looking for was already mine. Then when I fell asleep, in the second part of the night, I saw Chris Evans. He lived in an apartment and I met him at the stairway and he invited me to come in. The apartment was beautiful yet I know it has nothing to do with his house because when he bought that house in 2012, I said that was our house. But it wasn’t in our house that we were. Other people were present and the one I identified was Tony Stark or Robert Downey Jr. He was seated in the lounge and Chris was going to the other rooms of the house and he wasn’t all the time with us. We conversed with Tony Stark about the issues of the world, how we wanted to save the world or something. That puzzled me when I woke up because it isn’t common to hear people say they wanted Jesus as their father. Jesus is clearly distinct from the father and we call God our father but we hardly see Jesus as such. Then I remembered Isaiah calling him the everlasting father when he ascribed to him the attributes of wonderful, counselor, the mighty God, the everlasting father, the prince of peace. That brings Handel’s masterpiece to mind: unto us a child is born unto us a son is given and the government shall be upon his shoulders and he shall be called, you know, what we listed above. So that was my clear second encounter with Chris Evans in a dream; or the little I can remember from it. The third dream happened sometime still in 2017 and it was very close to what I would likely do when I meet him. It was surprising to me that in the other dreams, I didn’t tell Chris all that I would like to tell him presently. In the first, I was kind of shy to speak to him; afraid, intimidated. It used to happen to me like that in the past when I was a fan of the twin brothers Ronald and Frank de Boer of Oranje. I had a dream where they lived in our building. It was the storey under ours. I knew they were there. I saw them going out and walking through the corridor to the staircase yet I didn’t talk to them whereas all that I wanted in the waking state was to meet them and tell them how that they are favorite football players. And so in the first dream, Chris my dream was seated in front of me yet I was afraid to talk to him. If he had not called me out and told me to speak, we wouldn’t have had any contact in the dream. And in the second, we met and he took me to the apartment, but he wasn’t with us all the time. He hardly participated in our talk. He would listen to Tony Stark say how much he loved the man Jesus, but I don’t remember what he himself said. Yet he was attentive and listened with reverence though going out and coming in. In the third dream, however, I met him behind the scenes. I don’t know which backstage it was; a television’s probably. He was likely holding a show and he came there and was hurrying to go back. But I met him there. Then in my dream, I saw myself doing what I would likely do when I meet him. I told him what he means to me, how I’ve longed for years to meet him, ever since I saw him as Johnny Storm in The Fantastic Four. At that time, we didn’t know his name. Internet was rare and so my siblings and I called him Johnny. I came to know his real name only after some seven years. Even today, we still identity him as Johnny. So I told Johnny how much I loved him. Everything I wanted to tell him, I told him and he listened to me till I said everything. Then I woke up happy that I told Chris Evans what I wanted to tell him. He knew what he meant to me and how that house he bought was our house. I don’t remember his response, but the fact that I told him my wish of being with him was the wish realizing. He had to hear it for it to be. That’s why I want to get to him. I’m certain that when he learns about me and what I feel about him, it will be like I said it, like I want it, like he heard it. So if you know Chris Evans, please tell him about me. I thought my feeling would transcend space and get to him and tell him what I feel, but apparently, they haven ‘t. And he doesn’t even consider me on social media. Something doesn’t strike him; telling him that I’m here so he can get to me and we can write to each other. The world didn’t turn out to be as I saw it in my childhood. In my childhood, I had high hopes for humanity. I believed in humanity. I wanted to see the advent of peace, righteousness, happiness for every man. I wanted the cartoon heroes to come and stay with us. I wanted to meet all the people I love. I believed my feelings would get to them somehow and they would come and take me home. When I listen to the songs I used to love as a kid, we are the earth, power of the flame and those I composed, I cry because when I was I singing those songs years ago, I didn’t know the earth would be like I see it today. I sang, I prayed: famine is no more, leaders live in love, all the peoples of the earth’s happy, we live as brothers and sisters, whites and blacks of all religions, no wars, abundance of peace and the children are happy, none go hungry. That was before year 2000. Year 2000, which in the 90s was seen as the dawn of peace for humanity, turned out to be the dawn of a new form of warfare, conflict. It started with the horrific event of 9/11 and that fashioned the beginning of the millennium and so the hopes for the 2000s disappointed. I had despaired until I heard Dr Shawn Smith speak of the fullness of the blessing of the gospel of Christ. Then I believed again in the salvation of humanity. My cartoon heroes haven’t come to me yet. But then a man played the Human Torch and then the iconic Captain Nootra and thus became the superhero that appeared in the world for me. I had waited for superheroes all my life and I realize they are in Chris Evans, Steve Rogers and Johnny Storm. Come to me, Chris and take me home. Dans la ville d’Aven vivaient quatre adolescents qui étaient les meilleurs amis du monde. Ils étaient exceptionnels en raison de leurs rêves extravagants. Alain avait pour passion les étoiles et les voyages dans l’espace, Noah voulait rencontrer ses super-héros, Zach souhaitait défier l’homme le plus fort du monde et Ryan voulait voir l’Agape face à face. Les enfants des temps modernes, ils étaient doués quand il s’agissait de la hi-tech, la science-fiction, l’espace, les arts martiaux, les bandes dessinées et dessins animés. Ils passèrent leur temps, utilisèrent leurs talents et dépensèrent leurs économies sur ces choses, ce qui voulait dire ne pas manger à l’école. Ils vivaient dans le même quartier, fréquentaient la même école et se trouvaient partout ensemble. Ils se rassemblaient la nuit sur le toit de la maison d’Alan pour parler d’aventures fantastiques. En regardant les étoiles, ils crurent sérieusement et attendirent patiemment l’accomplissement de leurs rêves. Un vaisseau spatial, RM XIX, allait être lancé depuis leur ville. Comme ces quatre amis en parlèrent chaque jour, Noah eut une idée. Elle suggéra qu’ils se faufilent dans le navire et de s’y cacher jusqu’à ce qu’il soit lancé. Ils se sont tous mis d’accord, car c’était leur unique chance d’arriver à l’espace. Ils ont commencé à recueillir des informations sur RM XIX et la base d’astronomie. Ils ont emballé leurs affaires et se sont préparés pour le voyage. Le père d’Alan travaillait au centre d’astronomie alors il prit quatre bouteilles d’air de là. Noah apporta des provisions alors que Zach et Ryan établissaient un plan. Vêtus de combinaisons spatiales spéciales, ces enfants ont pénétré furtivement dans la base d’astronomie et ils sont entrés dans le vaisseau spatial quelques heures avant le lancement. Aucune porte ne résista à l’ingénieux Ryan. C’est ainsi que les quatre amis se retrouvèrent dans le troisième compartiment du vaisseau spatial au compte à rebours. Pleins d’expectatives, ils attendirent silencieusement l’heure H. Puis RM XIX décolla et les enfants se dirigèrent vers l’espace. Ils étaient tranquillement assis dans le troisième compartiment jusqu’à ce que le navire s’éloigne de l’atmosphère terrestre et devienne stable dans l’espace extra-atmosphérique. Après quelques minutes d’anticipation, les enfants se sont levés et ont regardé par la fenêtre transparente. C’est là où ils ont vu tout le tableau. Alan, Noah, Ryan et Zach ont exulté en regardant en admiration le mystère de l’espace. Et quelle merveille c’était! Ils ont commis une erreur néanmoins. Ils ne se sont pas renseignés sur les étapes du trajet de la navette. La mission de RM XIX était de fournir à la station spatiale VEX M21 des matériaux de construction. Elle n’avait pas à suivre un cours direct. Elle devait faire un détour en chemin, se dirigeant d’abord vers Jupiter et ensuite, revenir à la station spatiale. Ce que nos amis ne savaient pas c’est que le compartiment dans lequel ils se trouvaient serait coupé pendant le détour. En effet, près de Jupiter, le petit compartiment fut déconnecté du navire principal et dériva seul dans l’espace inconnu. En réalisant ceci, les enfants ont paniqué et craignirent que tout était perdu. Mais Ryan rassura ses amis et ils étaient prêts à affronter courageusement leur situation. Les enfants ont mis leurs casques, se sont tenu les mains et ont fermé les yeux en ayant une confiance totale. Pendant qu’ils communiaient, un petit météore est venu tout droit à grande vitesse et a cogné la capsule avec force. L’impact fut si grand qu’il brisa la capsule, projetant les enfants dans l’espace extra-atmosphérique. Ils se sont débrouillés à se tenir les mains à nouveau, formant ainsi un cercle dans l’espace. Ils se souriaient grandement car ils vivaient à cet instant ce dont ils avaient l’habitude de parler chaque soir: flotter dans l’espace. Comme ils restèrent dans cette position, savourant l’exceptionnalité du moment, une lueur brilla à une distance et se déplaça progressivement dans leur direction. Ils sont restés calmes et se sont tenu chaudement les mains en regardant la luminosité qui s’approchait. Elle les a finalement atteintes et les a submergés, les entraînant dans le néant. La sensation désagréable de l’eau éclaboussée sur le visage d’un dormeur les réveilla hors du coma. En se levant, ils ont remarqué que leurs combinaisons spatiales avaient disparu et ils étaient dans leurs vêtements normaux. Ils ont regardé autour et ils se sont retrouvés dans un champ, beau et espacé avec des paysages magnifiques en arrière-plan. Ils savaient que ce n’était pas la Terre mais quelque chose semblait encore familier. Ils furent stupéfiés lorsqu’ils se retournèrent et identifièrent celui qui se trouvait derrière eux comme en effet…. In the city of Aven lived four teenagers who were the best friends in the world. They were exceptional due to their extravagant dreams. 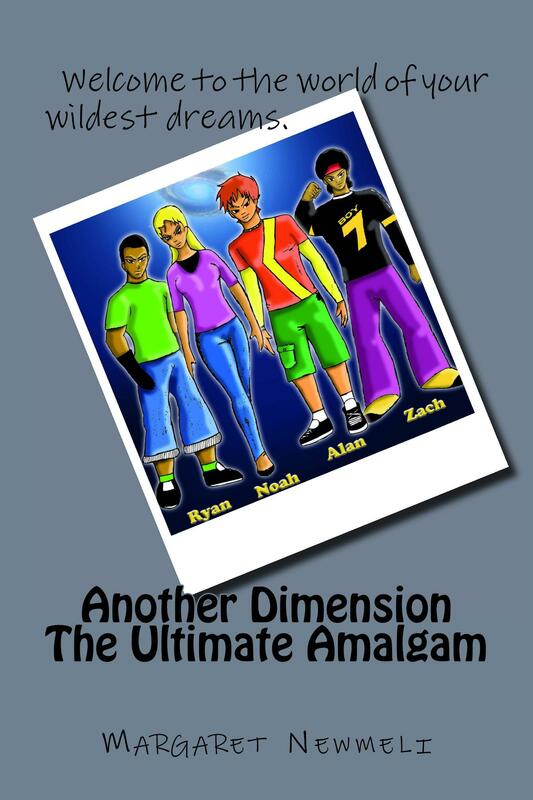 Alan’s passion was the stars and space travel, Noah longed to meet her superheroes, Zach wanted to challenge the strongest man in the world and Ryan desired to see the Agape face-to-face. Children of modern times, trust them on anything hi-tech, science fiction, space, martial arts, comics and cartoons. They spent their time, talents and savings on these things, meaning starving at school. They lived in the same neighbourhood, attended the same school and were everywhere together. They used to gather at night on the roof of Alan’s house to talk of fantastic adventures. As they gazed at the stars, they believed earnestly and waited patiently for the fulfilment of their dreams. A spaceship, RM XIX, was launching from their city. As these four friends talked about it each day, Noah had an idea. She proposed that they sneak into the ship and hide there until it was launched. They all agreed, as it was their only chance of getting to space. They began collecting information about RM XIX and the astronomy base. They packed their stuffs and got ready for the trip. Alan’s father was working at the astronomy centre so he got four air bottles from there. Noah brought provisions while Zach and Ryan drew up a plan. Dressed in special space suits, the children secretly broke into the astronomy base and entered the spaceship a few hours before launch. No door resisted the smart Ryan, and so the four friends found themselves in the third compartment of the spaceship at countdown. Full of expectation, they waited quietly for zero hour. Then RM XIX took off, and the children headed for space. They sat silently in the third compartment until the vessel moved out of Earth’s atmosphere and became steady in outer space. After minutes of anticipation, the children got up and looked out the transparent window. They got the best of it. Alan, Noah, Ryan and Zach rejoiced as they gazed in wonder at the mystery of space. And what a marvel it was to them! They made a mistake though. They failed to inquire about the shuttle’s stages of movement. The mission of RM XIX was to provide space station VEX M21 with materials for construction. It never had to take a straightforward course. It had to detour along the way, moving first towards Jupiter and then coming back to the space station. What our friends did not know was that the compartment in which they were would be cut off during the turn. Indeed, near Jupiter, the small compartment was disconnected from the main vessel and drifted alone into unknown space. On realizing this, the children panicked and feared all was lost. But Ryan reassured his friends and they were strengthened to face this situation courageously. The children put on their helmets, held hands and closed their eyes with total confidence. As they were communing, a small meteor advanced straight ahead at high speed, and hit the capsule forcefully. The impact was great and tore open the capsule, projecting the children into outer space. They struggled and held hands again, and so formed a circle in space. They smiled widely at each other for they were living there what they used to talk about each night – floating in space. As they remained in this position, savouring the uniqueness of the moment, a bright light flashed at a distance and moved gradually in their direction. They remained calm and pressed each other’s hands while gazing at the approaching brightness. It caught them eventually and the luminosity engulfed them, driving them into oblivion.